I was going to do something elaborate and fancy for dinner tonight but then I got lazy. And hot dogs were on sale. And then I remembered hot dogs and beans, otherwise known as franks and beans. I threw together the Pioneer Woman's baked beans, which I'd been meaning to make for a while. 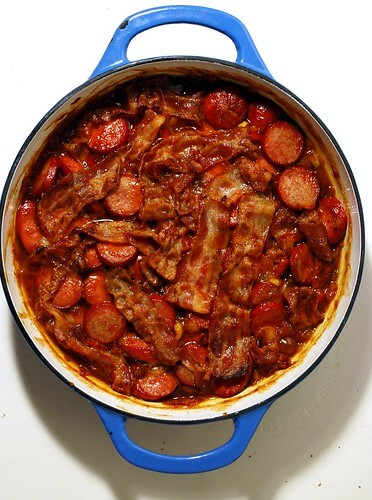 Basically you doctor up a few cans of baked beans, and bake them for a long time with some bacon. I added some jumbo hotdogs and served them with a salad for a lazy, delicious, super cheap dinner. Cook the bacon on low for a while, until most of the grease is rendered out. Set it aside, and toss out a little of the grease. Keep some, about 2 T, and cook the onion, pepper, and garlic on medium-low to soften. Stir together bbq sauce, brown sugar, cider vinegar and mustard, then stir into the onion mixture. Add the beans, stir in the hot dogs, then lay the bacon on top. Bake at 350 for about an hour and a half. Serve with a salad and maybe some sort of bread for dipping. I'm not really a hot dog person, but this actually sounds really tasty right now. Mmm, beans and franks! OOh. I was going to make a GF pineapple upside down cake for a dutch oven cook-off...but now I will be making this instead! Looks tasty! I just made franks and beans this weekend too! But, I made it with veggie dogs: Tofu Pups are the only ones that I know of that are gluten free. I just found your blog via a link through SmittenKitchen - I don't know whether to thank the Gods, or curse them! I've been gluten free since January, and am so excited to pore over your entries. Thank you!